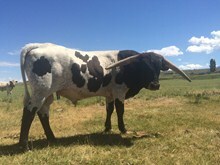 A great cross of huge horned genetics, with Rio Grande, Sunshine Tari and Overdrive. Her dam, is now 82" T2T. This bloodline is extremely slow for the first couple of years and then the horn growth explodes. 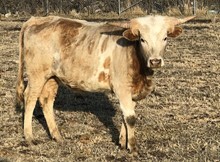 2013 bull, PCC Double Dare, by Rim Rock, that is owned by Clay Gines and SC Longhorns in NV. 2014 heifer, PCC Double Trouble, by Rim Rock.